Rice is our staple food. Where ever we stay countries beyond we usually eat rice for lunch. We need pouring curries and also dry curries daily to pair with rice. Usually we make Sambar, Rasam, Moor for pouring curries. This routine makes boring towards when we saw these curries. So today i have come up with a yummy alternative for those routine curries. I have taken recipe from a tv show years back. Laksmi Nair popular chef prepared this curry and i took hints and made this curry years back and it was a super duper hit. From that day on wards i used to prepared this curry quite often. Easy to make tasty curry i am sure you all are going to love this curry. Heat oil in a pan and add mustard seeds and fenugreek seeds. When the mustard seeds starts splutter and the fenugreek seeds turns dark golden brown colour, add the cumin seeds and curry leaves in that hot oil. Add chopped onion and fry in that oil for a minute till transparent. Now add the drumstick and cook in that oil for a minute. Add turmeric powder, red chilli powder and coriander powder and cook for just fifteen seconds. If you cook longer the masalas get burnt. Add two cups of water and mango pieces and salt. Close with a lid and cook till the drumstick cooks well. First pour the thin extract and cook for minute or just the curry starts to boil. Check for salt and add if needed. Add the thick extract and switch off the gas when the curry starts to bubble. Do not over cook after adding thick coconut extract. Note: You can use finely ground coconut paste instead of coconut milk. 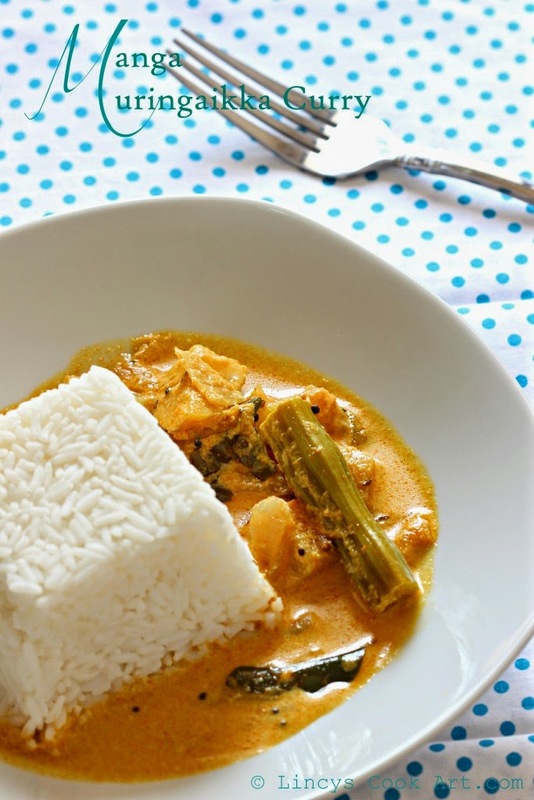 Or you can take coconut milk only once together and make this curry. Looks delicious curry...... Adding mango is very interesting !! hmmmmmm...my favourite...looks wonderful and yummy! Healthy and delectable muringaikka curry . omg such an lip smacking curry to go with hot steamed rice :) sent me drool... looks so yummmy !! Lip-smacking curry.. looks very yummy.. Love your presentation dear. My all time favourite combo in curry,i can die for this curry,love it.